Determine if your device is rooted. 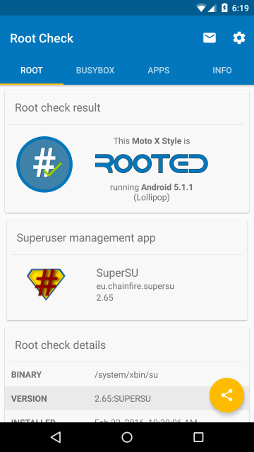 Get a detailed report on the root status of your device, including information about the superuser management app, su binary, and device details. Send a detailed email report to any developer or other user on the root status of your device. 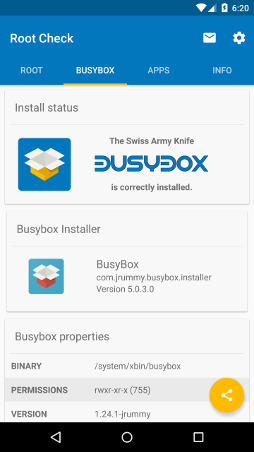 Check if BusyBox is correctly installed on the device. Get information about any BusyBox utiltity. Learn all about root. Are you a newbie? The app provides great resources on understanding Android root. The rooting process usually includes exploiting one or more security bugs on the device. Once rooted, the su binary is copied to a location in the current process’ PATH (e.g., /system/bin/) and granted executable permissions. A third-party supervisor application, like Superuser or SuperSU, can then regulate and log elevated permission requests from other applications. By using a supervisor application, you can deny superuser permissions to the vast majority of apps and only allow the necessary ones that you trust. Do rooted devices get over-the-air updates? If you haven’t installed a custom ROM, you will likely still get over-the-air (OTA) from your carrier. OTA updates may un-root your device. If you flashed a custom ROM, you will not get OTA updates from your carrier. You may, however, get notifications for updates to your specific ROM. Root Check is published by JRummy Apps Inc. — a trusted company with over 37 million installs from several root related apps on Google Play. JRummy Apps has been publishing apps that harness the power of root access since 2010. We realize that there are many new users who want to know more about root. Root Check is a useful tool to check if a device has proper root access and learn more about rooting. Jrummy Apps has been developing great apps for years. This is no exception. Easy to use, non-intrusive, works great and provides a great deal of device info. Checks root status and Busybox status. Very helpful FAQ section with a root terminology dictionary. Great for newbies... like ME! Clean and user friendly interface.